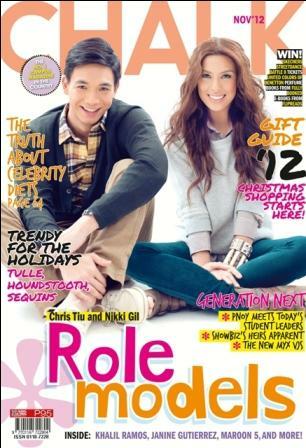 Chris Tiu and Nikki Gil Share Their College Moments in Chalk Magazine! In Chalk’s November issue, Chris Tiu and Nikki Gil serve as the ultimate role models for this generation as they talk about how they juggled school with their many other commitments during their days as student-slash-celebrities. It was the same for varsity player Chris who juggled basketball practice and studying for his Management Engineering course. “I really had to prioritize if I want things to work,” he said. Find out more about Chris and Nikki on this month’s Chalk issue. Also featured in the number one campus magazine are the kids with famous last names, including Janine Gutierrez, Kiana Valenciano, Kobe and Andre Paras, and Clarice Patrimonio. Plus, get started on Christmas shopping with this year’s Gift Guide, steal Hollywood actress’ red carpet makeup looks, get the lowdown on celebrity fad diets, and more. Meanwhile, Chalk Magazine hosted a thanksgiving celebration entitled “We’ve Got Game: The Big October Issue Blow-Out” at the Aracama Bar and Restaurant at the Fort Strip recently. The occasion was attended by hundreds of well wishers from the media, fashion industry, and even celebrities and personalities like Andie Eigenmann, Megan Young, I.C. 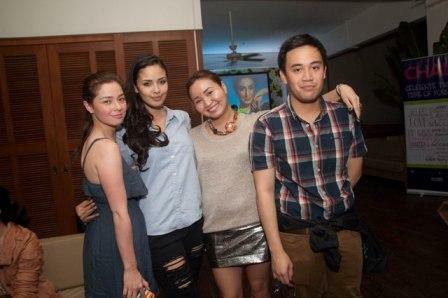 Mendoza, Mike Concepcion, Nicole Anderson, and Victor Silayan. Last month’s Chalk cover girl, Jasmine Curtis-Smith surprised everyone at the party through a video message where she thanked everyone and invited them to grab a copy of Chalk Magazine. Grab a copy of Chalk Magazine’s November issue, on newsstands now.